In the second installment of the “Twisted Lit” series, Shakespeare’s Macbeth is relocated from medieval Scotland to a modern-day high school in Anchorage, Alaska. Wallflower Skye Kingston, photographer for the school newspaper, is content to quietly crush on her friend, Craig MacKenzie, one of the populars and a member of the hockey team. It’s all she can do, really, since he’s already been claimed by Beth, one of East Anchorage High’s most imposing Queen Bees. Skye’s life takes a turning point when she attends a wild, off-campus party where Duncan Shaw, the hockey team’s captain, meets an unfortunate end. 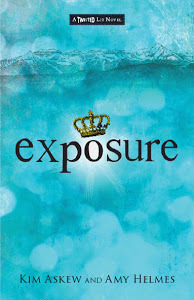 (The meaning of the title— “Exposure”—will become evident when the reader finds out how he died.) For most of the high school, Duncan’s death is shrouded in mystery, but three students alone know the truth—Craig and Beth, who perpetrated the deed, and Skye, who overhears their frantic conversation after the event takes place. Skye tries to be supportive with Craig, but he becomes increasingly hostile with her and others. Should Skye stay loyal to her friend and keep her silence, or should she go to the police? Overall, a solid, teen-friendly version of Shakespeare’s tragedy. In fact, I think I actually like Exposure more than Tempestuous. I am definitely interested in seeing what else this series has to offer. Recommended for Ages 15-17 for Language. Great review! I have bookmarked you and will remain in line with your new posts. keep writing and give informative post!